By the end of Classic GI Joe Volume 3, about sixty percent of the franchise’s most popular characters had been introduced. The issues collected in Classic GI Joe Volume 4 came out right when the original Sunbow animated series started airing and became the foundation of that show’s cast, especially with the debuts of Spirit Iron-Knife, Flint, Lady Jaye, and the Crimson Twins. It becomes clear that Hasbro’s need to constantly introduce new characters was starting to hamper the story. There was no way for someone like, say, Blowtorch to really fit into what Larry Hama wanted to do, so as a result, he spends more time in a brown jumpsuit than in his firefighter’s outfit. Hama could get away with it because at the time, GI Joe was Marvel’s highest-selling subscription title. There are some major narrative through-lines in this volume, although nothing akin to the Destro Saga in Volume 2 or the origin of Snake-Eyes. One of these concerns an attempt on Cobra Commander’s life by a boy introduced all the way back in issue #10. Billy Kessler is later revealed to be the Commander’s son, but he still refuses to tattle on the Baroness and Major Bludd’s complicity in his scheme. His storyline intersects with that of Storm Shadow, becoming his protégé in what I swear was the basis for Damian Wayne as Robin. The white-clad ninja’s plot about being framed for his master’s death continues past this volume and will later become entangled in the Snake-Eyes origin morass. Before this, though, the book does tie up some loose ends with a return to Snake-Eyes’ cabin and Destro and Firefly’s attempts to seek revenge for their humiliation in the swamp. You can always tell when a character is one of Hama’s favorites, and such is the case with Spirit Iron-Knife, who gets a nuanced and very skillful portrayal right out of the gate despite having a rather silly “buckskin” uniform. I’ll even give Hama a pass for having Airborne in this story solely to set up a joke about “calling in the Indians." This arc also introduces the full idea of the Crimson Guards being surgically altered to look alike; when the original Guard, Fred, dies, Fred II is sent to take his place to the consternation of his kids. One of those kids will many years later become Snake-Eyes’ apprentice Kamakura. One of the biggest plots to run through Volume 4 is one that won’t really kick off until the next trade. This isn’t IDW’s fault; they’ve split up the original 155-issue run into 15 trades to keep the price point steady, and if they tried to cut up the title into definite arcs, they would have run into resistance from fans. A chance run-in with “Bongo the Balloon Bear," a party-delivery mascot, eventually leads into one of Cobra’s infamous super-science plots after Bongo turns out to be Candy Appel (pun intended), the gorgeous daughter of a Cobra scientist. Random encounters like this normally feel lazy, but it’s a plot that the Joes would have encountered anyway as it starts out near their base in New York. It also provides a storyline for the newly introduced Rip-Cord, who falls hard for Candy and works as a nice every-man viewpoint character. Much of the rest of the trade is filled up with done-in-one or done-in-two stories in an extended version of the "Cooldown method." Issue #35 sees Breaker, Clutch, and Rock’n’Roll on a road trip vacation, only to fall prey to the Dreadnoks. Issue 3#6 follows three plotlines concerning a mysterious Cobra installation at sea, switching between the “GI Jane” headquarters freighter, the Killer Whale hovercraft and the Liberty Island ferry in rapid succession. This feels like a proof of concept for what would become GI Joe: Special Missions, a second and more mature title not beholden to the toyline. The book starts to build up steam again near issue #38, as one team of Joes raids Candy’s father’s house and another goes into the Amazon to free Dr. Adele Burkhart, the activist kidnapped all the way back in the very first issue. Why does she return? Because the first issue of GI Joe Yearbook, which reprinted that issue and special files, came out around the same time, so it served as a direct sequel for newer readers. There’s a key issue I skipped over: issue #34, “Shakedown!," which is up there with “Silent Interlude” as one of the greatest stories in the GI Joe franchise. It follows two shake-down flights: Ace and Lady Jaye take the revamped Skystriker out for a spin, while Wild Weasel takes the Baroness on a qualification run on the new Rattler. The two planes encounter each other by accident and an issue-long dogfight ensues. Both planes are taken to their limits, and so are their pilots, who eventually salute in passing as they run out of ammo. The Skystriker and Rattler were icons already and this issue confirms them as the vehicles of choice of GI Joe and Cobra. Humorously in hindsight, Ace brags about the Skystriker’s 92K memory ... which is just barely more memory than my 8GB iPod Nano and over 1000 times less memory than an F-22. 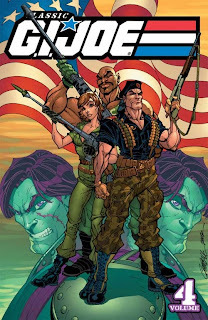 IDW has decided to reprint Classic GI Joe Volume 4 warts and all, and this includes some poor coloring, especially when it comes to hair. Just because Lady Jaye officially replaces Scarlett in the Joe ranks doesn’t mean that she should suddenly be a redhead. The Crimson Guard also frequently look wrong; it’s very possible that main artists Rod Whigham and Frank Springer didn’t have the proper character models at the time. Even with these mistakes and the confusion of the rapid introduction of characters -- the last issue brings in Barbecue mid-battle! -- this is part of GI Joe’s golden age. I’ll be highlighting more of this classic title while the brand’s fate on both toy store and comic book store shelves is in jeopardy.